Right, as suspected, all this food testing is taking its toll and I feel fat. Well the food testing and the fact that I was in Paris last weekend and consumed all things Parisian – ie bread, pate, cheese, croissants, frites (chips are French if you say it like that right?). 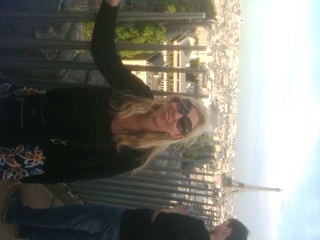 I did walk up a lot of steps to burn some of it off though – no wonder French women aren’t fat, climbing up the Arc de Triomphe (see here I am up the top) is like a mini marathon but still all the munching has sent me off into a little carb fest ever since, which, as normal, has to stop now before it translates into added pounds or inches. 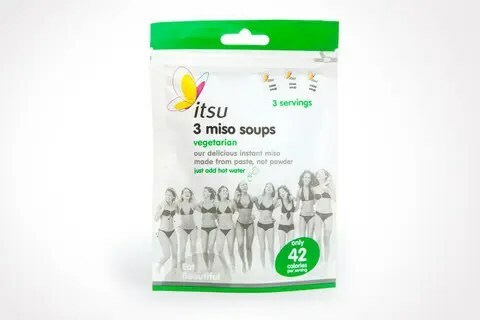 Thankfully the nice people at Itsu (a Japanese takeaway chain here in the UK) have decided to help me reset my tastebuds from French food to Japanese – and lower my snack calories with it, by bringing out little sachets of miso soup – at just 44 calories each. I’m drinking one right now as I type and very yummy it is too. It’s got little bits of seaweed in it and that cloudy miso ‘dust’ that you don’t get with the normal miso paste I buy and as such I feel just like I’m in Japan. Well apart from the fact that I’m drinking it from a cup with a picture of the Loch Ness Monster and the words I’m a Believer on the front rather than a little black bowl. Does that make it Niso? Not sure, but anyway…. I love miso and yes, it is good for you. Made from fermented soybean paste, it could potentially balance hormone levels in, erm, ladies of a certain age.It’s been linked to a lower risk of breast cancer and it’s a source of probiotic bacteria. It’s only tiny downside is that it can be high in sodium so, it might not be for you if you’ve got high blood pressure (a sachet of the Itsu soup contains the equivalent of 2.4g of salt – that’s over a third of your daily requirement). I admit this does concern me a little. Oh, and do you know what else miso is good for – cooking lentils in. I could never work out why lentils in restaurants are one of my favourite dishes, and why lentils at home are boring dry food. And then I realised – they cook them in stock and they do it very slowly and leave just a little bit of liquid in the bottom. The other day I’d run out of stock and so I tried miso paste and wow, it was amazing. So, there you have it – snack and lentil transforming item. If you want to try the Itsu sachets you’ll find them in Sainsbury’s priced £1.59 for three sachets. And my lessons on making sushi!